Copa America 2019 'Official Ball and Trophy' unveiled ! Copa America 2019 ‘Official Ball and Trophy’ unveiled ! 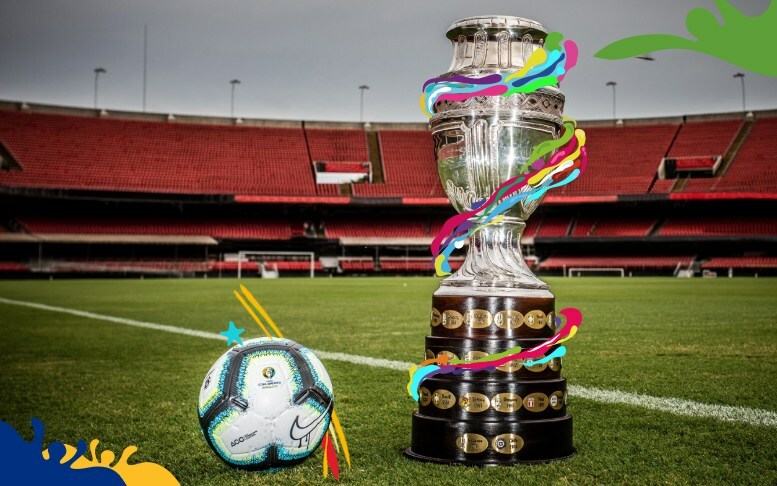 The official Ball for the Copa America 2019 has been made public, with still 3 months to go for the biggest football event in South America. Along with the ball, the official trophy was also revealed. The 46th edition of the Copa America will be hosted by Brazil for the first time since 1989. The 26 matches of the tournament will be played in six venues of five different cities. The opening match will be played at Morumbi Stadium in São Paulo. The Brazilian great Ronaldinho unveiled the official ball of the Copa America 2019. Nike Rabisco will be the official ball for the oldest tournament on South America. The first match will be played between Brazil and Bolivia at Morumbi Stadium in São Paulo on 14th June, 2019. Chile are the defending champions in both previous occasions (2015 and 2016). The winner of the Copa America 2019 will represent South America in FIFA Confederation Cup 2021. This entry was posted in Breaking News and tagged Copa America, Copa America 2019, Copa America 2019 official ball, Copa America 2019 Trophy. Bookmark the permalink.